Juddmonte homebred Suffused was the easiest of winners in Saturday's G3 The Very One Stakes, rocketing from last to first in the far turn and sprinting away from her rivals to cross the wire five lengths in front. The 5-year-old daughter of Champs Elysees, ridden to the third win of the afternoon for jockey Jose Ortiz, covered 1 3/16 miles over Gulfstream's firm turf in 1:51.40 for trainer Bill Mott. Suffused broke well enough from the center of the six-horse field, but settled to the rear of the field easily for Ortiz. She was never more than seven lengths off the pace-setting Olorda, who ripped through a first quarter in 22.82 seconds. Quiet Kitten tracked from the outside in second, and Desiree Clary was third. Olorda settled in for the next quarter, clocking the half in :47.21 with a one-length lead. Approaching the far turn, Ortiz appeared to hesitate briefly while deciding which route he wanted to take with Suffused. He chose to take the clearer outside route, and Suffused overcame all five of her rivals in about a quarter of a mile. She held the lead at the head of the lane, and continued to draw away under her own power down the stretch, winning by five lengths at the wire. Quiet Kitten was second, and Paige held on to third. Bred in Great Britain, Suffused came to the United States in early 2016. It took several starts for the mare to acclimate, but The Very One is her third graded stakes win since the overseas trip. Overall, Suffused boasts a record of 7-4-1 from 17 starts, with earnings of over $620,000. 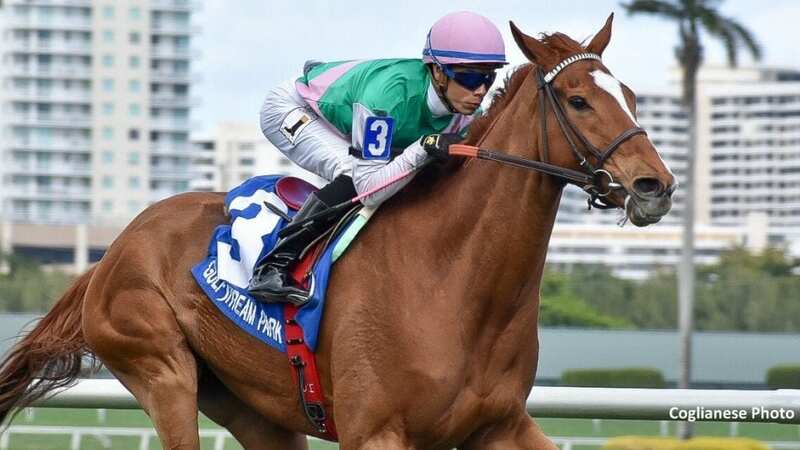 This entry was posted in Racing and tagged Champs Elysees, Graham Motion, Gulfstream, jose ortiz, juddmonte, suffused, the very one, The Very One Stakes by Paulick Report Staff. Bookmark the permalink.